XRCEL: You won Ventouxman and then finished 2nd at IRONMAN France. Mentally, what is it like going into your fourth triathlon – Embrunman, which also happens to be on one of the most difficult courses in the world, in a short amount of time? Carrie Lester: We used Ventouxman as a training race for Ironman France and then we used the three races as preparation for Embrunman, which really was our “A” race of the summer. With this strategy, I never felt mentally exhausted and approached each race knowing what I wanted out of it. I was ready physically and mentally for Embrunman and all of the preceding races prepared me perfectly for it. What strategies did you and your trainer Scott DeFilippis agree to properly get you physically ready for Embrunman? Why is it important to include XRCEL as part of your fueling plan for training and racing, especially with these extremely challenging back to back races. We really used the three races to prepare for Embrunman and we also added a focused bike block before and after the Alpes d’huez race. We stayed at the Alps for seven days and rode full days before and after the race. This type of training set us up perfectly for Embrunman. We also focused on nailing our race nutrition in all of our races and made sure we consumed enough calories during training so we could back up each day. A lot of times, we can never get enough food in, so this is why we used XRCEL every day. Having won Embrunman before, and knowing the challenging course you were about to face, did you train in the same way as in years past or did you change things up? We typically train in the mountains for 8-10 weeks over the summer leading into this race and, if the schedule allows, we will do a bigger riding block mid to late July. Over the last few years, I have done some races leading up to Embrunman, such as Challenge Roth or Alpe d’Huez. Last year I only raced IM France three weeks before, but this year, the three races plus the riding block in Alpe d’Huez was the best preparation I have had so far. You have to be fit on the bike and confident in the mountains, which in turn, helps produce a strong run. It takes a special kind of athlete to race Embrunman, let alone WIN! What kind of mindset do you need and what was your main goal and focus? You definitely need to be patient, confident, and strong both physically and mentally. It’s a long day and many things can go wrong, so it’s important to be confident in yourself so that you can overcome anything and stay positive. My main goal this year was to win and my secondary goals were to set a new course record and run my fastest marathon for this course. In past years, I have wanted to win, but my focus was more on just getting through the day. I was more experienced this year and, with that, came the aggression to win. How did your race day unfold from start to finish? Were you feeling “it” on race morning, and can you tell if it’s going to be a good or bad day before you hit the swim start? Race day is such a long day and you can never judge the day on how you feel in the water. The swim in Embrunman is just a “wake up”. The race starts at 5.50am, in the dark, and for the first lap of the swim it’s a weird feeling because you don’t know if you are awake or still asleep! This year I wanted to attack the swim, and try and swim with Charlotte Morel, who usually puts a few minutes into me in the swim. I was surprised and thrilled at how easy it was this year to stay with her as I have been working on my swim and am very happy with my progress over the last year. Charlotte and I basically rode together for 140 kilometers of the bike. I would push a little on the climbs and flatter sections, and she would attack the descends, so neither of us really got away from each other. With about 40 kilometers to go, we were heading through a fast, flat section and I hit a bump in my aerobars and it threw me off my bike onto my ribs and back. I was in a little bit of shock, but came around quickly once I realized I hadn’t broken anything. My back and ribs hurt, but I was ok. Even though I snapped a shifter on my bike, it was rideable, so I carried on. I just kept telling myself to get to transition and assess the damage. I wasn’t sure if I was going to be able to run, but once I started out of transition I was shuffling along at a good pace and the plan was just to get through each lap as best I could. Charlotte had a lead of about five minutes when I started out on the run, but she was struggling and I caught her within the first 10 kilometers of the marathon. From there I just kept my pace going and tried putting in as much of a gap as I could. Going into the third lap of the run, I saw how big the gap was, and I was massively relieved as my ribs and back were really starting to ache. I did whatever I had to do to get through the last lap, walking the aid stations, drinking, eating, and anything else to help me get to the finish line. It was the best finish line to date! We know you crashed on the bike in the race. What went through your head in that exact moment and how were you able to push yourself along, mentally and physically, and set yourself up for this huge win? At the exact moment, as I was going down, I was thinking “damn number 13!!”. Thirteen was my race number, if you can believe it! I just wanted to win so badly the only way I would have been stopped was if I had broken something and couldn’t continue. I would have never forgiven myself if I didn’t try and carry on. It’s true that we are all stronger than we think. Why do you think you race so well on the most difficult courses in triathlon and how do you utilize XRCEL in a tough race like Embrunman? We prepare for these races in the mountains for 8-10 weeks and it definitely helps. I have natural strength across all three disciplines and when we put that together with the right preparation, XRCEL, and nutrition, the results are positive. XRCEL has been a huge part of my success over these longer, harder races because it is extremely easy to digest for the whole 10hrs of racing, so I rarely have the energy highs and lows that come with poor race nutrition. Over a period of extended racing, it’s common for people to have GI issues as most of the blood flow has left the stomach and gone to the extremities, keeping the body cool, and they can’t digest anymore fuel. Thanks to XRCEL, I don’t have this problem! It’s like rocket fuel! Describe that feeling as you crossed the finish line as the Embrunman champion. I felt relief, disbelief, extreme happiness, and the utmost satisfaction! What are the benefits of having Scott Defilippis as your (KIS Coaching) triathlon coach? Scott knows me so well, and sees me every day, so he knows how to train me to get the most out of me without the risks of overtraining or injuries. I have progressed the most in my career since he has coached me, and we are still improving, so clearly, it’s a good match. He also recognizes the importance of recovery and balance, which is hard for most professional athletes to incorporate into their life. 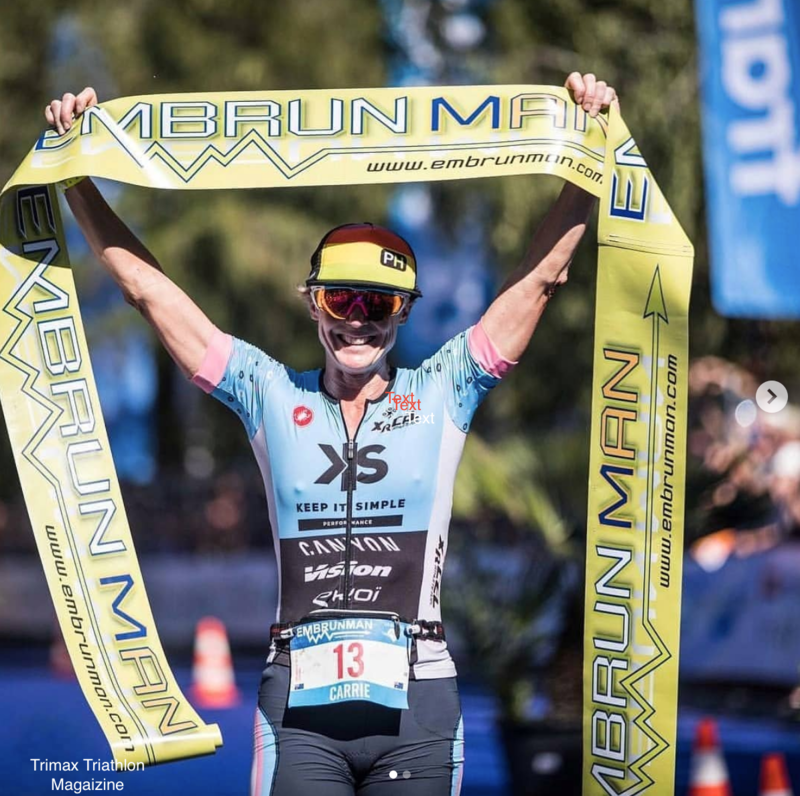 How does winning Embrunman help you as you head into your Kona training? All four races were planned as a 10-week Kona training block. I am not a person who can train full on for 10 weeks for one race, so we use the summer of racing as a training block. After I recover from Embrunman, I will put in five solid training weeks leading into Kona.